What Is Space? If Only We Knew : 13.7: Cosmos And Culture Did the universe originate from nothing? In a new NOVA series, Brian Greene will be describing some of the modern scientific views on space and time. 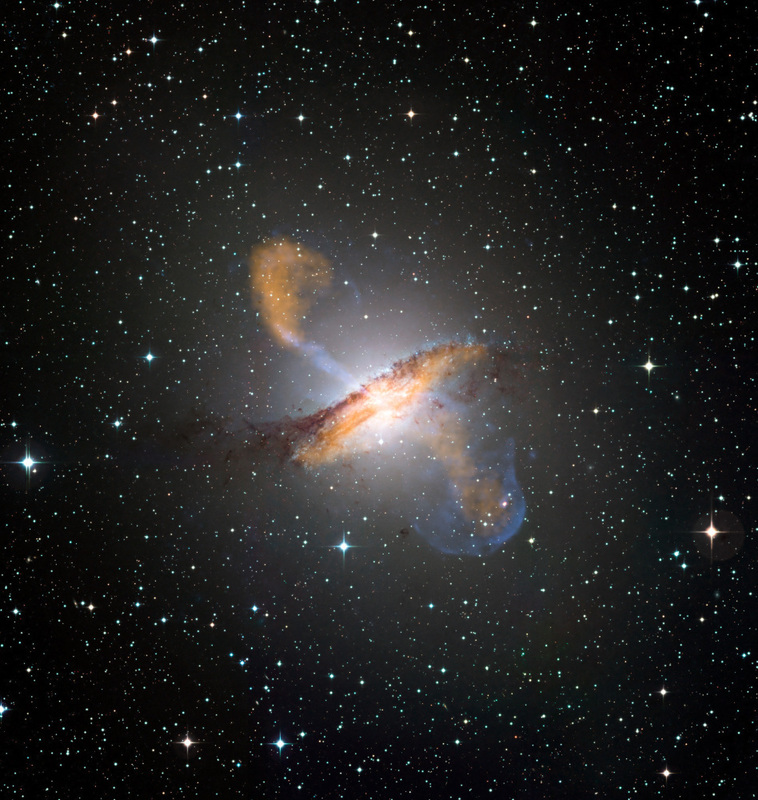 A color composite image of Centaurus A, revealing the lobes and jets emanating from the galaxy's central black hole. Tonight, PBS will air the first episode of a four-part NOVA documentary hosted by Brian Greene, based on his book The Fabric of the Cosmos. From the description and a quick preview, the episode will present some of the key modern ideas concerning the nature of space, both from the perspective of Einstein's theory of general relativity — the theory we use to describe the universe as a whole, and from the perspective of quantum mechanics — the theory we use to describe the world of atoms and subatomic particles. It's a good way to start a series that will present to viewers the state of the cosmos as we know it. From Einstein's general relativity, we will learn that space, contrary to what Newton thought, is far from the rigid arena where nature's drama unfolds. Quite the contrary, space is an actor too, responding dynamically to the presence of energy and mass: the larger the concentration of mass, the more space around it bends. Instead of Newton's mysterious action at a distance (how can the Sun influence Earth without touching it? ), Einstein explained gravity as the plasticity of space: Earth orbits the Sun as if space around it were concave. The reader can experiment with marbles going around the drain of a sink. From quantum mechanics, we learn something even more remarkable: space is not empty. You'd think that if you removed every material object from a room, including all the air, with some imaginary super-pump, the room would be "empty," that is, without any matter in it. (Assume the walls of the room are fantastically strong so as to not implode. This is a "thought experiment.") Well, even an empty room is never really empty. One of the fundamental results of quantum physics is that everything fluctuates: the world of the very small is forever a-jiggling. Hence, the position of a particle (like an electron) and its velocity are always changing, in constant restlessness. As a consequence, its energy is never zero. In fact, you can never set the energy of empty space to zero because it's always fluctuating about this value. For a short amount of time, energy conservation can be violated and you get something out of nothing. In practice, this happens by the amazing creation of matter and antimatter particles out of empty space (or vacuum), what we call virtual particles. They pop out of the vacuum and go back to it.